Don’t shop for it … Argos it! 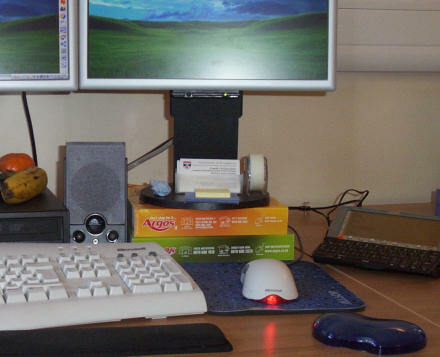 You may have noticed the other day when I posted the same picture (above) on my blog that my two CRT monitors sit on top of matching monitor risers. 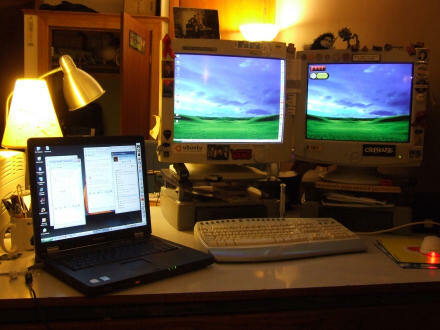 I found pretty early on after getting a PC that I felt much more comfortable sitting at my computer if my monitors were sitting up at eye level. At work I’ve found the same thing, because my LCD monitors were simply sitting at the maximum height of the monitor on my desk I found myself hunched over my desk and wondering why I came away from work each day with a sore lower back. So yesterday I experimented by raising my monitor on top of the cardboard box that my Creative 2.0 speakers came in — I’m quite resourceful like that! And it made all the difference, so I determined today to do something about it and get something more permanent. Buy a monitor riser similar to the one I have at home. Ask work to buy one for me. Find out if there were any spare monitor risers sitting around the office. Improvise. (Incidentally, the monitor riser of choice within the Business Improvements and IT Services units, I discovered, appears to be a redundant SpiderPort (an old piece of networking kit) box, with old Course Catalogues sitting on top of those to add any further height customization. As the advert goes: Don’t shop for it … Argos it! I’d now like to see this solution advertised within the Argos catalogue in the computer monitors section (that’s pp.532-533 in the new catalogue). Posted on Friday 26 January 2007 Wednesday 3 October 2018 Categories ComputerTags Computer, for dummies, PC, usability2 Comments on Don’t shop for it … Argos it!